RESTON, VA--(Marketwired - Jul 11, 2016) - The Graduate Management Admission Council (GMAC) today unveiled its User's Guide to Full-Time MBA Rankings, a comprehensive online tool designed to help prospective graduate business students better understand the ranking methodologies established by five well-known publications. Housed on mba.com -- the council's student facing website viewed by more than eight million unique visitors yearly -- this guide clearly summarizes and compares the content included in each of the five ranking methodologies. "Our research shows that individuals applying to graduate management education programs consider rankings an influential part of their decision-making process," said Sangeet Chowfla, president and CEO of GMAC. "Though rankings exist to provide useful information to judge the quality of MBA programs, the existence of multiple rankings contributes to confusion among applicants. We created this resource to clarify the differences among the various rankings, as no one ranking methodology can speak to the individual needs and aspirations of every candidate considering a business degree." Rankings are appealing to applicants because they provide some level of clarity and order to a marketplace of business schools that is highly complex. They curate diverse data points from a variety of sources into a simple, easily comparable measure of overall quality. The inherent issue with rankings, however, is that quality is highly subjective and there is no universally agreed upon way to measure it. For that reason, multiple rankings exist for full-time MBA programs, each with its own methodology that draws upon a different mix of data indicators and weights. Available at mba.com/rankings, the interactive guide highlights each of the five major rankings (Bloomberg Businessweek, The Economist, The Financial Times, Forbes and U.S. News & World Report) by breaking down their methodologies across standardized weighting categories, identifying distinctive aspects of each ranking, and presenting a compilation of other useful ranking information and analysis. Each ranking publication uses its own unique methodology to assign weights to various data indicators. The greater the weight, the greater influence it has on determining a school's ranking. The User's Guide to Full-Time MBA Rankings breaks down how each of the methodologies assign weight across 14 standardized weighting categories. Interactive tree maps allow the user to explore how much weight the rankings place on each category, in addition to clearly defining each data indicator with dynamic captions and showing the breakdown between fact-based and opinion-based indicators with a responsive sliding scale. Comparing the five methodologies across standardized weighting categories allows the user to easily compare and contrast the approaches each publication takes to creating its methodology. This guide also reveals the "distinctive emphasis" for each publication's ranking -- the weighting category or categories that most differentiate a specific publication's methodology from the others. What makes a weighting category distinctive is that no more than one other ranking publication uses it, and if another publication does use it, they assign it less than half as much weight. Distinguishing among rankings in this way can help the user understand what factors contribute most to making each ranking unique. With each new edition of a ranking publication, a school's ranking position can change. Some ranking publications see a bigger year-to-year difference in results than others. The User's Guide to Full-Time MBA Rankings analyzes the last two years' editions of ranking publications, providing data on precisely how much the results changed in one year. In addition to detailing the average school's position change -- both overall and among schools ranked in the top 20 -- the guide shows the full distribution of a school's position change. "Since rankings change year to year, candidates should only consider them as one aspect in their decision-making process," added Chowfla. The full-time MBA rankings for each of the five publications. About GMAC: The Graduate Management Admission Council® (GMAC®) is the nonprofit organization of 216 leading graduate business schools from around the world. 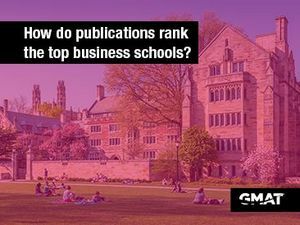 GMAC is the owner of the Graduate Management Admission Test® (GMAT®), used by more than 6,100 graduate programs worldwide -- along with other products designed to help students find, connect, and apply and gain admittance to business and management programs around the world. The council is also the owner and administrator of the NMAT by GMAC™ exam, used for entrance into graduate business and management programs in India. GMAC is based in Reston, Va., with offices in London, New Delhi and Hong Kong. The GMAT exam -- designed expressly for graduate business and management programs -- is continuously available at 630 test centers in 115 countries. Additional information about the GMAT exam is posted on mba.com. For more information about GMAC, please visit gmac.com/newscenter.